I have no idea who Ashleigh Brilliant is, but I like her style. So I post this today to remind myself - and perhaps you as well - to slow down, take rest, and breathe. Sometimes it's the most urgent thing to do. UPDATE: So, Ashleigh Brilliant is a man. You can find out more about HIS work and life here. And, one of my favorite card readers, Lee-Anne Peters couldn't agree more. 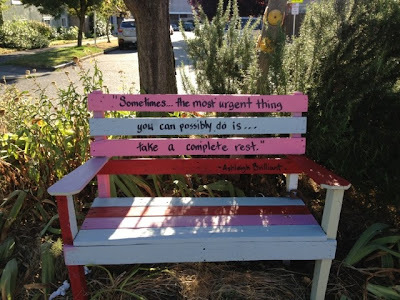 This week is all about the urgency of a complete rest. Just stumbled across your blog and was going to say Ashleigh Brilliant is a man but I see you know that now. P.S. I have also been to one Vipassana 10 day silent retreat in Queensland Australia. I think this has grabbed my son's google profile. My name is Jenny not Christopher!